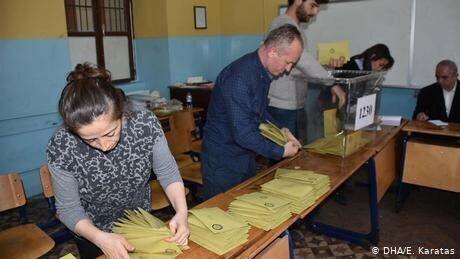 After most outcomes had already been decided in municipal elections around Turkey on March 31, there were no results released for Istanbul throughout the night. The race between ruling Justice and Development Party (AKP) candidate and confidant of President Recep Tayyip Erdogan, Binali Yildirim, and opposition Republican Peoples' Party (CHP) candidate Ekrem Imamoglu was neck-and-neck. At first Yildirim was clearly ahead, but the lead was steadily narrowing. Shortly before midnight, Imamoglu was only a few thousand votes behind his AKP opponent. But then information from Istanbul suddenly ceased. Voters remained in the dark for 13 hours as to whether an upset had occurred: Did Istanbul, after 25 years, have a social democratic mayor again? Turkish state-run news agency Anadolu, often abbreviated AA, is a major source of election data in the country. It researches the results of the vote counts and distributes that information to the media. But on election night, the agency's management decided to stop updating the Turkish media. "In Istanbul, where the vote count for the candidates was very close, the best thing was to interrupt the count and wait for all the data to arrive," a brief statement said. Critics see this unusual decision as proof that Anadolu wanted to deliver a late victory to the AKP. "Why the AA hasn't released any data for a long time, it hasn't told us," Mislet Dikmen, president of the Izmir Journalists' Association, told DW. Dikmen has demanded an explanation for the interruption to the data flow, arguing it is arrogant not to provide one. The agency has refused to give any information about where it gets its figures, which frustrates opposition voters and journalists. "We don't know its sources," Dikmen said. "If the agency doesn't name the source and makes no statement, its boss, Senol Kazanci, should resign." Two former Anadolu employees and one active Anadolu employee told DW that they did not know where the data came from. An insider explained that a special technical service handles the election data, which means the majority of agency staff do not have access to the election data transmission system. "Obtaining election data from one particular party facilitates election rigging," former general director Mehmet Guler, who headed Anadolu between 1997 and 2003, told DW. In his day, he said, representatives of the agency would have collected the data themselves in each city. Even before the local elections, trust in Anadolu was shaken. The agency, which has in effect a monopoly in Turkey, was criticized for not being impartial in the run-up to the municipal elections. In terms of financing, Anadolu depends on the government — 57 percent of the agency is owned by the Ministry of Family and Social Policy. The rest of the shares are held by private individuals. In a confusing company structure, the AKP government is also an important business partner of the agency. There were indications during the last Turkish municipal elections in 2014 of a close relationship between Anadolu and the Turkish government. After the elections, Kemal Oztürk, then-head of the agency, appeared at the headquarters of the AKP. He explained his appearance by pointing to his attachment to the ruling party: "I worked for this party for 10 years. I had dozens of my friends there, I was friends with ministers." Anadolu has still not explained why the transmission of election data was interrupted and the source of the figures remains open. This has led to conspiracy theories among the Turkish public. It is feared that the cooperation between the Turkish government and the agency could have lead to manipulated elections in the past.